LOVED all of the pictures. Thanks for the mini tour of DC. I have never been, but would love to visit someday. I can imagine how upset you must have been when you got pick-pocketed! JERKS. I would have cried too and probably done the same exact thing! But at least everything worked out and his parents took care of everything! Big sigh of relief! Love the candid pics.... you guys really are precious. Sorry about the credit card....that wasn't a very nice welcome from the city!! But like you said, at least it wasn't more. Love the pictures! Sounds like an amazing trip! I have never been to our capital, but I am thinking I should someday soon! Sigh. I LOVE DC and want to go back. All of your pics are great! You 2 are adorable. Too bad about the pick-pocket. That stinks! I would've cried, too. That sounds like so much fun!!! Love the pics! Isn't the changing of the guard awesome? You should hear what they go through to be one of the guards! Glad you enjoyed your visit, the pictures are great. And I meant to ask yesterday, but which H&M did you go to? Looks like you guys had a blast! I love DC - I definitely need to go back soon. Yall are so cute. Looks like a great trip! Love the candid pics of you guys. I loved getting to see all of these pics! It was fun to get my own little taste of DC since I've never been. And by the way, your outfits and hair look so cute in all of these. I really like your hair this length! So sorry about the pick pocket incident. I can only imagine how you felt since it was your in-laws...how terrible! At least they were really good about it, and at least it wasn't a large amount of cash! what great pics!! all soo cute! looks like you guys had a great time! Oh how fun! These pics are awesome. And, how exciting that you got to meet a blog friend AND tour the Capitol? Very cool! love all the pics! yall look like you had a wonderful time! That is awful about the credit card! I'm sure you in-laws were very understanding! Tulips are totally my favorite flower!!! And how cool you got the hook up with a blogging buddy & a tour!!! 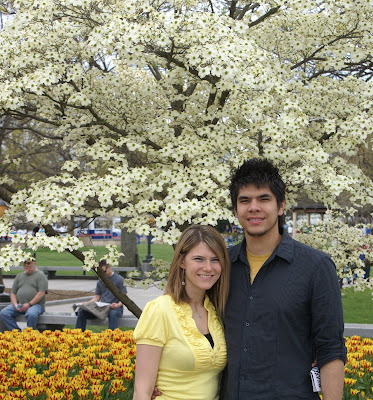 The picture of you two in front of the flowering tree & flowers... thats GORGEOUS!!! What an awesome trip.. I am so sorry you got pick-pocketed!! That is scary!!! Looks like so much fun, I can't wait to take Hayden there! great pictures... you are so pretty!!! Great pics!!! Looks like a blast! What a great trip!! Y'all look so cute! Sorry about the credit cars, at least your in-laws let you use theirs! :) I love tulips too, so pretty! Thanks for sharing! Again, I cannot believe you got pick-pocketed . . . crazy! :-) and i loved all the pictures - looks like a fun trip! OK you and Luke are soooo cute!! I love all of your pics! And how scary about the pick pocket dude!! I would have freaked too....especially with it being the in-laws! I like all the pics of just you guys! You're both adorable together! Looks like a good time! These pics make me happy! Glad ya'll had a great trip! What great pictures of your time in DC. I agree with you --tulips are one of my absolute favorites, too. The Changing of The Guards is such an emotional experience, isn't it? I love the picture of you and Luke there. And how fun to meet up in real life with a bloggy friend! Bloggy friends are the best! I've been to DC, but it has been a long time. We want to go back in the near future. Looks like you guys had a wonderful time (minus the pick-pocket). I can't believe that happened to you...bless your heart. Love all of the pics! Your pics are so cute.cute.cute!!! What a fun trip! Great pictures! Loved the flowers-the tulips are so pretty! Love the pics! it was so great to meet you and luke!! can't wait to see you again! Awesome pics! I absolutely love DC. Don't feel bad about the credit card. It's not your fault... it's the person who stole it that should be sitting on a bench crying. I once took the Monuments by Moonlight tour. It was great except for the fact that our bus driver almost drove us into the river. beautiful pics!!! looks like you guys were so "into it"..the sight seeing and stuff! love the last pic. I'm so sorry about the whole credit card thing! That is awful :( I haven't ever been to DC, but I really want to. Your pictures made me want to even more now!